It seems like this trip has been one long waiting game. 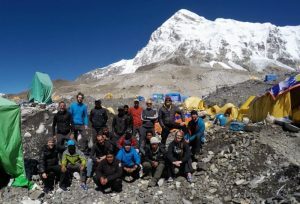 I don’t have any “news” per se, but Summit Climb posted that John and team were headed up to camp 3 yesterday which puts them right on their anticipated schedule. They should be waking up in about 2 or 3 hours and heading up to camp 4 tonight. If the weather continues to remain fair, we’re looking at a summit push starting tomorrow evening. So since I can’t give you a very interesting John update, do we have any Sandra Bullock or “Hope Floats” fans? 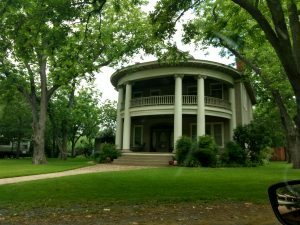 I was visiting a farm in Smithville, TX last week and realized I was 2 miles from “Birdee’s” house. I’m not 100% sure I’ve seen the movie but I did swing by anyway. 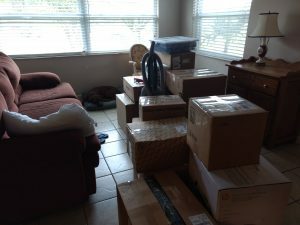 And this is what my house currently looks like. The pup and I leave Florida for good on Thursday and we are so excited to be closer to John so we can be together on weekends. Longstreet can barely contain his excitement. Thanks for keeping up with John’s progress. I may update again, but most likely I’ll leave it to John when he gets back to basecamp. Hopefully the internet will be good enough for him to give a thorough report. I swore that I wouldn’t fool with internet here but my cellular texts weren’t getting out and I wanted to keep everyone abreast. We flew in from Namche two days ago and have been readying for our push. Today we double checked our oxygen system, repacked necessary climbing gear and solidified our olans. (We have no real leadership here, no one has heard from our expedition leader in weeks. He is apparently at camp 2, where we head directly from base camp tonight) .Fortunately, we are all self sufficient climbers with very competent Sherpa. 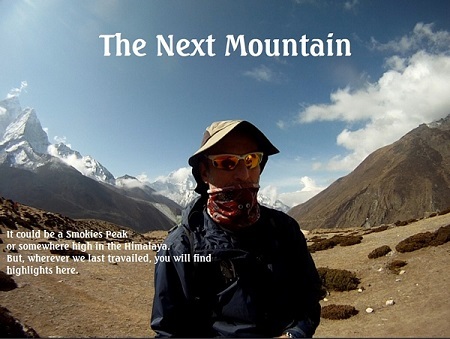 I have implored our Sirdar, Kaji, to relay daily updates via the summit climb news website. I do have faith in him because you folks deserve to know that things are progressing as expected. Your comments are out of this world, thanks to you who have taken time to post, and thanks Myers for the updated weather. Right now, our expected summit day, the 22 isn’t looking great. But that’s a ways off and it will change. Laurel will let you know what she knows. I leave you with a photo of an avalanche coming off Nuptse this morning. That’s my tent in the foreground, totally safe, of course. They are a frequent occurrence here on Mt. Everest as Spring and Summer collide. Update- summit is open, we leave tomorrow. Let me begin by wishing my Mom and all other Moms out there a Happy Mother’s Day. For us here in Namche @ 12000 feet it has been reminiscent of the movie “Groundhog Day”. Each morning brings hope of a return to Basecamp but weather and lack of rope progress keeps us grounded. 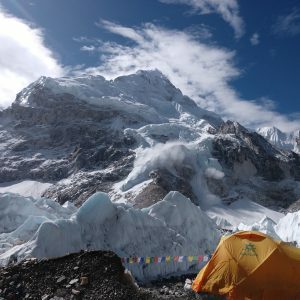 No teams have reached Everest summit or camp 4 due to unusually high winds and cold. But we are as comfortable as can be expected in this terraced village full of coffee shops, bakeries and local restaurants. I have frequented so many aforementioned establishments that my phone picks up emails and text alerts simply by remaining in my pocket as we pass through town and all the Wi-Fi hits. It’s like one big repeater system. Similarly, local merchants have gotten to know us by name and have taken time betting on our summit dates in accordance with the hourly changing weather forecast. For me it has been an exercise in patience and mental calm. A week in the high Himalaya is a boon for any adventurer. Dealing with the vagaries of uncertainty is just a “need to manage” risk in this game. I pretend that this is a vacation within a vacation and events flow quite smoothly when we ignore the impending tasks. One acquaintance we have made is Sibusiso Vilane from Africa. 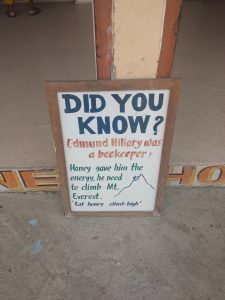 He is quite famous and also waiting here in Namche. Today I asked him about his audience with the Queen of England. That was quite a story, then we had lunch. I just got word that the ropes are now fixed and the route is open so progress is occurring. We have a helicopter on retainer so day after tomorrow I suspect we will depart then. When we leave, Laurel will be manning, she will hate the use of that word, the comms. Check here and her personal Twitter feed @theLaureldunn. IlI drop a line before hand. Thanks for your comments, I read each one. So grateful to hear from long lost friends, friends, colleagues and strangers. 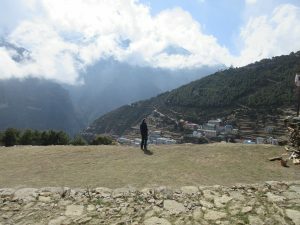 We are now in Namche allowing our bodies to heal and recover from our week up at camps 1,2 and 3 on Everest. A surreal thickness of air and greenery engulfs four of our Everest team that hiked 15 miles down from Basecamp and hitched a ride on a helicopter the remaining distance to Namche Bazaar. I reflect on the preceeding events as if they are far removed. We just heard that the same storm which hit us here last night wrecked havoc on base camp and we are still gathering information about the extent of the damage to our camp and friends. In the early morning hour of 3 am, Saturday, April 28, 8 Everest and four Camp 3 climbers departed to thread our way through the notorious Khumbu icefall. In darkness we attached ascenders to rope, crampons to boots and packs to cold backs. My head was filled with images of danger, falling seracs,tumbling ice blocks and bottomless crevasses. The reality was fortunately much less dramatic. They say the Icefall route is one of the safest in years. Yes, we did ladder crossings, crevasse crossings and the like. I remember the first time I placed my steel crampons on the aluminum rung of a ladder spanning a bottomless crack. There were two sections of ladder and I gripped the rope tighter than a tourniquet. Dawa steadied me like an anchor. It took 6 hours to ascend through what Conrad Anker called the “Ballroom of Death”. The sun rose to illuminate giant ice walls that signifihe the top of our Khumbu experience. Camp 1 was still hours away. My breathing was labored beyond comprehension and the sun was beating me into the snow. Our team was similarly puffing through this section. By now it was blazing hot and I doubted my ability to reach that speck of yellow far above. Eight hours was my final time to camp 1. We rested there for two nights in the sweltering Western cwm. The morning Dawa and I blazed out our first hazard was a huge icewall with multiple ladders lashed together. Then there was a 3 ladder crossing over a yawning crevasse. And to think I had relegated that scene to the icefall prematurely. The cwm is an oven on a cloudy day. This morning saw a few passing vapors. Very far in the distance, I spotted tents across a minimally rising expanse. Dawa assured me it was HOURS away, and I believed him. My Sherpa brother doesn’t lie. It is at this point my body temps rise to unbearable. I’ve not been this hot ever. Four hours it took to coax me into camp 2 at 21000 feet. That night was incredibly cold, single digits freezing. My toes numbed and the darkness was a battle to warm digits. My tentmate, Richard suffered as well. It snowed most afternoons at 2 on until dark. We had 10 people at camp 2 and the Sherpa did well to cook meals at this altitude. 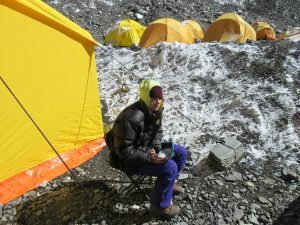 One of our team remained at camp 1 on oxygen. We rested before attempting to reach camp 3. A couple in our group, including ny new tentmate, tried to ascend to camp 3. Three turned around due to extreme cold and exhaustion. The two who reached 24,000 feet took 10 hours and looked like refried hell when they came dragging back. It was a harbinger of the following day. Again, it was freezing cold that afternoon, night and morning as we booted up for our biggest day. 8 am saw four climbers with numb toes depart for camp 3. 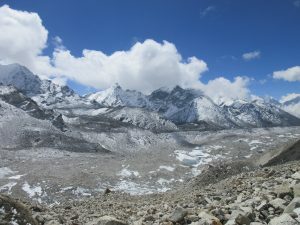 Two hours was when we hit the bergschrund which signified the beginning of the fixed ropes on the Lhotse face. Imagine 45 degree slopes with ropes hanging from ice screws to which we attach an ascending device, safety biner and start “jugging” skyward. Pitch after pitch of coordinated jug and kicking into blue ice was unrelenting for hours upon hours. Add to this the misery of the afternoon snow storm. I had stripped down to underclothes and ditched my shell jacket. This did little for the freezing wind and snow now sticky on my sweaty garment. The precipitous ground afforded little opportunity to modify wardrobe. Dawa Sherpa led over ice lip and ice lip. No margin for error existed here. We were three hours on the Lhotse face. I lost count of the number of rappels back down the Lhotse face we racked. I’m guessing near six or 7 full rappels and five arm raps. The ice was firm and polished, unforgiving lest anyone miss a rig. Dawa ensured that didn’t occur on his watch. With great relief and little sun we reached the bergschrund and cold booted down the glacier. me and I could barely stomach any of it. I drank what little water I could and passed out for the night. 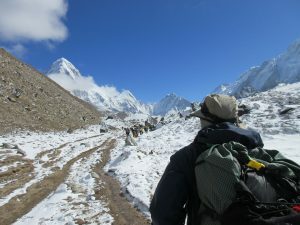 We left for Basecamp the following morning. That was another 5 hours including time back through the ice fall. We spent Seven days above 20 thousand feet and completed our acclimatization for Everest. I had likely lost 15 pounds and it showed. Our team was bedraggled, malnourished and exhausted. Michael, Neil, Tom and myself grabbed our packs after a daysd rest and walked 15 miles down to Pheriche. The following morning we hitched a ride on a helicopter to Namche where we currently remain. I can’t post pictures due to the unstable internet. I have a bit of stomach bug, along wit Neil but have time to sort this out here in lower elevation. We are safe, rested and recovering and hope to return to ebc in a few days. Thanks for following. John spent the past week acclimatizing up high in preparation for his summit bid. He and much of his team worked their way up Everest to spend nights at camps 1, 2, and 3 and touched at 24,000 ft (Everest is 29,029 ft for those of us that should know but keep forgetting and have to re-google every few days). I’d add my own commentary, but John is in Basecamp now and hopes to hike down lower to a town that may have WiFi in the morning, so I’m hopeful he’ll be able to provide more accurate info and pictures. 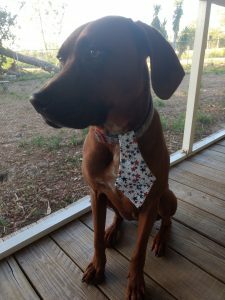 I’ll just leave you with a picture of our super cute doggo wearing his brand new tie. He got it last night and is pretty excited. John’s pretty sure he has a full blown sinus infection and forgot to pack Sudafed, so he’s battling that now. We’re hoping some meds left by one of the trekkers can be located and help with his congestion. Keep him in your thoughts as it’s making acclimatization and activity in general more difficult. 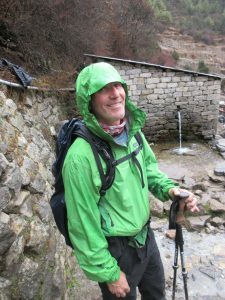 While he suffered up in basecamp (and will be for the next month since that’s apparently what mountaineering is about), I enjoyed as much of Nepal as I could cram into 4 days. 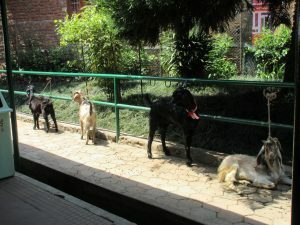 I spent the day after my altitude ordeal recovering in Kathmandu and planning some day trips for my remaining days in country. However, that evening I was reunited with two of the trekkers from our trip who had other plans. This gets long, but this is also about the only means I have to update John since we’re only able to text each other so you won’t hurt my feelings if you quit now. Cary, an incredibly nice Canuck even by Canadian standards, had planned on spending a few days in Chitwan National Park in central Nepal and invited my trekking friend Katrina and I to join him. Katrina and I had bonded instantly during the trek because not only is she also a Southern girl, but she also was in the Everest region entrusting the one she loves to the whims of the mountain- her husband Heiko is climbing Lhotse, which shares the same route as Everest until camp 3 (Heiko is also an incredible woodworker, so if you’re interested in some beautiful bowls or vases check out his website at http://www.hwrwood.com/ ). The former nurse even cleaned out a barf bag for me during my first night of the trek so I’m pretty much indebted to her for life. The 3 of us piled into a hired car the next morning at 7 am for what should have been a 5 hour ride to the park. 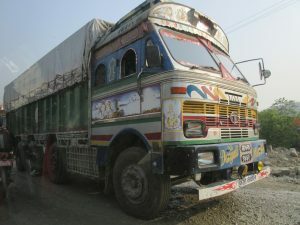 As we stopped at a roadside Nepali resort for lunch our driver informed us we would rest there for 4 hours. 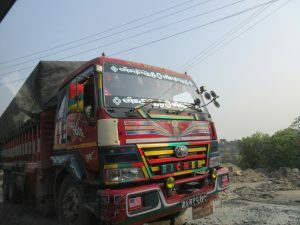 When we sought clarification, we were told that since a section of the road to Chitwan was destroyed during the 2015 earthquake, the road is closed every day from 10am to 4 pm for repairs. No one felt the need to tell us this whole time we were making our plans. So we waited and finally made it to our hotel around 5:30 (and the road- I don’t have time to go into it, but I have no idea what they’re doing from 10am to 4pm because it ain’t roadwork). 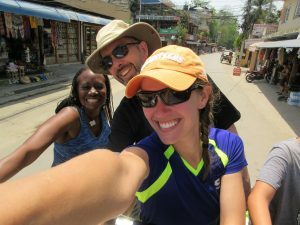 We started our morning hitting up a bucket list item for all of us- a jungle safari on the back of an elephant. We didn’t see any tigers or jaguars, but we got pretty close to some rhinos, deer, and a lot of wild chickens that look identical to and every bit as delicious as domesticated chickens. I would not recommend an elephant to anyone with back problems…or really anyone at all. However, while it’s incredibly uncomfortable you’ve probably gotta do it once. 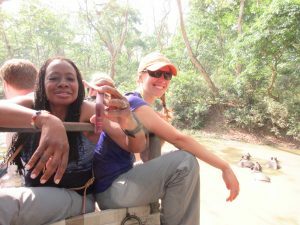 We then piled into a truck and made our way to the river where the elephants were bathing after our safari. 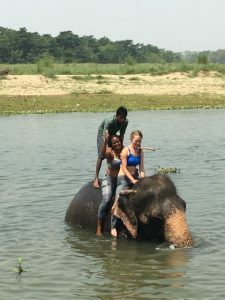 Bathing with an elephant may be one of the most fun things I have ever done- we crawled up on an elephant’s back (which was a struggle since elephants are sort of big) and were sprayed repeatedly with river water and elephant boogers. So far it doesn’t appear than any of us contracted anything from the river. 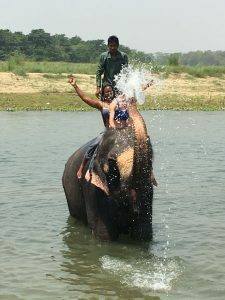 The bath ended when the elephant shook us off her back into the water. It was an unexpectedly ridiculous thing to do and so incredible getting to play on the back of such a massive animal. The next morning we got an early start to avoid the 10am road closure and to give us time to stop at a Hindu temple that required a gondola ride up to it. 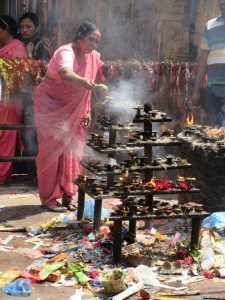 What we didn’t realize was that it was a participatory temple and to go inside you had to make an offering to the goddess Kali (and bribe a security guard to skip the 2+ hour line, but that’s another story). This was going on at the same time as the puja in John’s basecamp, so while he was dodging a Buddhist ceremony I was actively avoiding one of the Hindu variety. I’m currently sitting in a hotel room in Doha, Qatar for my 14 hour layover. If you’ve made it this far, thanks for humoring me. Thank you for being continually interested in John’s expedition, health, and safety. I have also really appreciated everyone’s concern about my illness and ability to get home, but I’m almost there and ready to be reunited with our dog (also, many thanks to my parents for housing him for us all month!). We love you all! These past few days have been characterized by a couple of challenges. First is my sinus issues that are consistent, if nothing else. Everyone has some form of Khumbu cough. Any mucous production for me ends this way. I am debating whether to treat with antibiotics because it affects acclimatization. But, I did take my first shower in two weeks. Man, was I disgusting. It involved a 5 gallon bag of cold plus one gallon of boiled water, a tent, a hose and a bar of soap. #bestshowerever. Yesterday, we made a run up to ABC on Pumori with the group. We climbed almost 2k feet. This saves us one trip through the icefall. It was a big workout for the team. Today was our Puja ceremony. No climbing is supposed to take place until the Llama and all Sherpa pray to the MTN “gods” . Team members place climbing gear boots, crampons and whatever they wish to have blessed and the ceremony devolves into a drunken bacchanal. I do not participate in Puja ceremonies but try to do so in a respectful way. This is the third one I have declined in my Himalayan climbing career. I figure that I have broken enough commandments in my life that this is one I can walk away from. I respect our Sherpa and their culture. They don’t necessarily understand and neither do many of my team. But in the end, we must each do what our conscience allows. I am appreciative of our hard working Sherpa. They still brought me a Coke and I joined them when the ceremony was concluding. It’s all good. We don’t have camp 1 fully established so a few more days remain before our first foray into the ice fall. We are building red blood cells and I walked around Basecamp during the Puja and met Mike Hammil. He is a legendary Everest guide who tolf me his team hasn’t really done much more than us. So all in all, things are normal here. I have a lucky coin that Kelly Bailey gave me, a lucky braided charm from Bri, a lucky autographed handkerchief from all my students at MA and lots of other important items to get atop Sagarmatha. John probably has a few uneventful days ahead of him and poor WiFi, so I figured I’d give my own trip report and update since yesterday was not only eventful but marked the end of my adventure with John. Until next time. For those of you asking about John’s health, he’s been able to avoid his typical altitude related stomach issues so far, but he has developed a runny nose. I honestly think we’d be more surprised if he didn’t develop some sort of sinus issue. (Me trying to eat rice porridge and ginger tea after a night of upchucking. Probably my favourite picture of the entire trip.) As for for me, I was flown out of EBC to the Kathmandu airport and transported by ambulance to a local hospital that specialises in altitude related illness. By the time I reached the hospital my altitude sickness was replaced by motion sickness from the bumpy helicopter ride and Kathmandu traffic. The doctor cleared me after a brief examination akin to a roadside DUI assessment and also assured me that my days at altitude are NOT over but that I need to take things more slowly in the future. So all is well with us both and John has now transitioned from trekking to Everest to starting to climb in the coming days. I did want to add a few pictures of the trek since John typically doesn’t have pictures of himself (other than selfies) and because I got a few he missed. 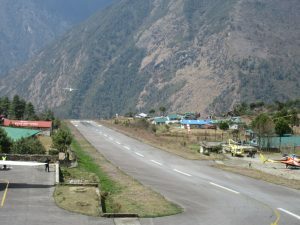 Plane landing at Lukla airport. My flight had clear weather (unlike John’s), but there was an audible gasp when everyone on board got a glimpse of the runway before landing. The single runway is carved into the mountain at a 12° angle with a solid concrete wall at the end. If you miss the runway…well, they only use senior pilots for good reason. Everyone’s favourite (well, mine at least) mountaineer after a long day of trekking to Namche Bazaar… and John taking in Namche Bazaar from our tea house well above town. One of the many cable bridges we crossed over several gorges. 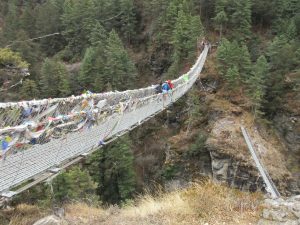 I thought these swaying bridges would be scary, but after seeing several yak teams crossing them without issue I figured my 120 lbs would probably not be sufficient to bring any of the bridges down. Some mountains. I think I was getting sick at this point, so just enjoy this picture and accept that I can provide no more detail. John following the yaks (or gzos, a yak/cow hybrid) that hauled our bags out of Lobuche village on our last day of hiking. 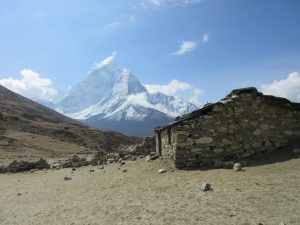 Abandoned hut near Dingboche with Ama Dablam in the background. 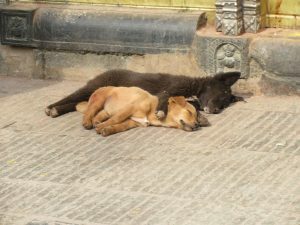 And finally, to prove that it is in fact Laurel and not some other imposter on John’s page, an obligatory puppy dog picture from the monkey temple in Kathmandu. We have appreciated everyone’s support and words of encouragement throughout our trip. Now the real work begins for John, and I couldn’t be more proud of or excited for him. 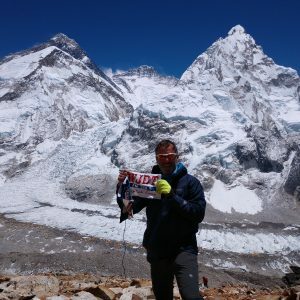 If he is unable to keep everyone updated here (WiFi at Everest BC is super expensive and very unreliable), I’ll do my best to fill in the gaps. Thanks everyone! I spent the morning, along with our team leader,Dani organizing a helicopter rescue and by lunchtime Dan Mazur, Dani and I had her en route to Kathmandu. She is currently at the hospital there thanks to the global rescue policy Laurel purchased in advance. I expect an immediate and full recovery. The antidote to altitude is lack thereof. Laurel is strong and imI proud of her for getting to fulfill her objective. Otherwise, I am okay. The mountain is beautiful and the sights and sounds are meeting expectations. I’m having difficulty posting photos here, we have limited bandwidth internet at Basecamp. But check twitter as well.